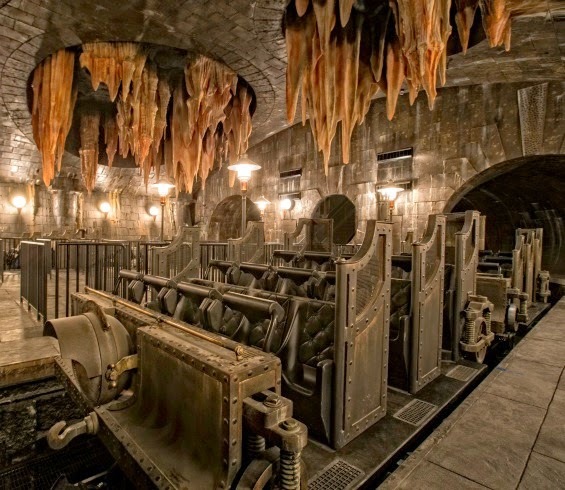 Harry Potter and the Escape from Gringotts ride recently opened at Universal Studios Florida to massive praise, frequent breakdowns, and seven hour plus wait times. The completely immersive experience seamlessly combines giant physical sets with massive projection screens. Edge blending techniques and brighter 4K projectors allow almost 360 degree screens where individual scenes can last as long as 40 seconds instead of just ten or fifteen as on other media based attractions. The videos are all in 3D and passengers have to wear 3D “goblin goggle” glasses. 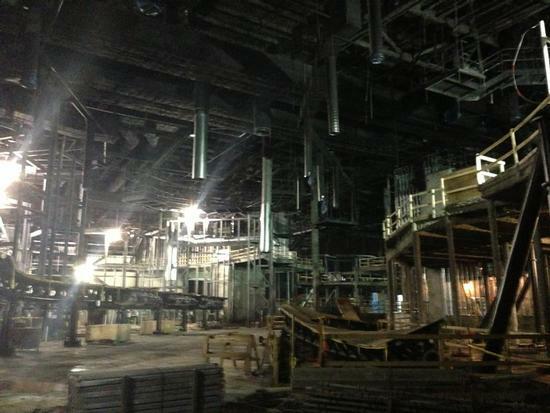 Official details released by Universal Creative are hard to come by (almost nonexistent). 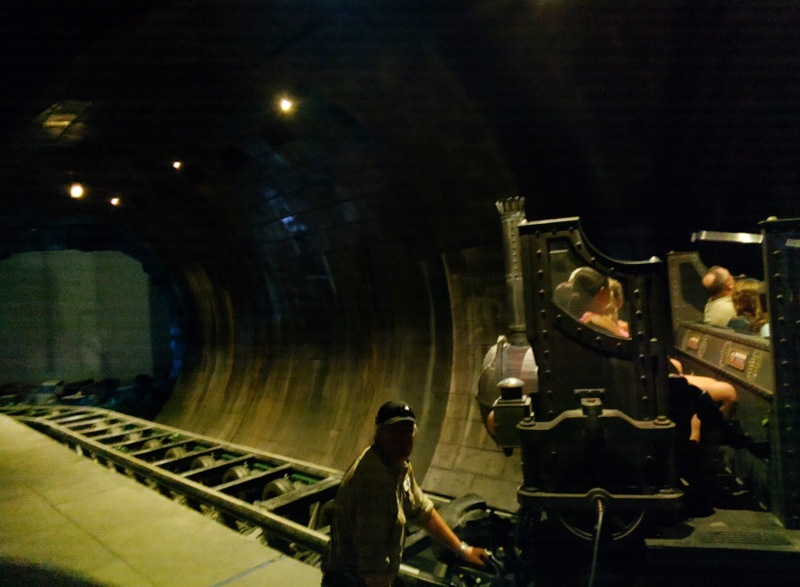 SO, just like we did with our breakdown of how the Hogwarts Express works, we thought we’d do our best to describe some of the technology behind this mind-blowing attraction. Leave this page to escape from spoilers. If you don’t want to know how the magic is pulled off or ruin any of the ride’s surprises then do not read this. Projection screen and physical set piece. Posted by Bluer101 on Disboards. Looking at a section of the ~2,000 foot long coaster track. Posted by Bluer101 on Disboards. Let’s begin by looking at the unique ride vehicles. Most reviews I’ve read online describe the ride vehicles (RVs) as being similar to The Amazing Adventures of Spider-man or Transformers. I think a more accurate description is they’ve taken the Men in Black: Alien Attack/Cat in the Hat RV and placed it on a roller coaster car. 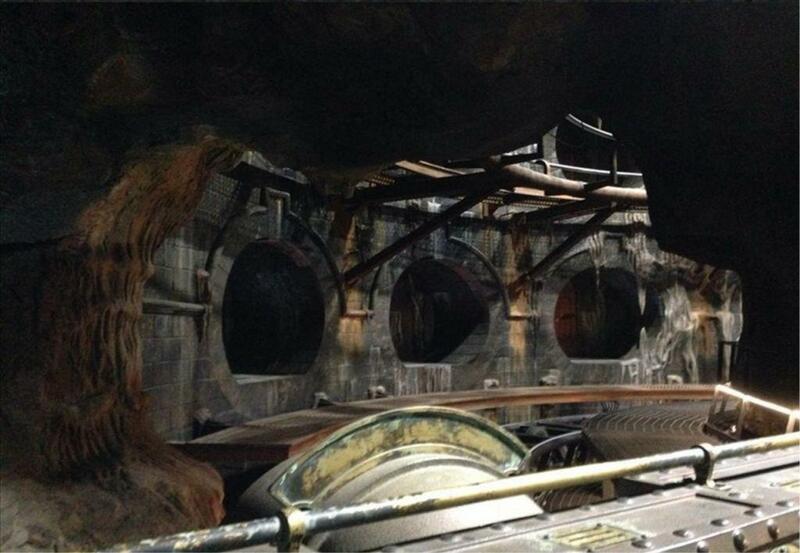 While the Spider-man/Transformers RVs have multiple degrees of freedom, the Gringotts ride vehicle itself has just two: (1) translation along the ride path and (2) controlled horizontal rotation (spinning!). The nine trains of Gringotts are composed of two cars each with twelve passengers per car and uses individual lapbar restraints (no, the ride does not go upside down). The passenger carrier is supported on a turntable, which in turn is supported on a vehicle chassis that rolls along the Intamin manufactured coaster track. 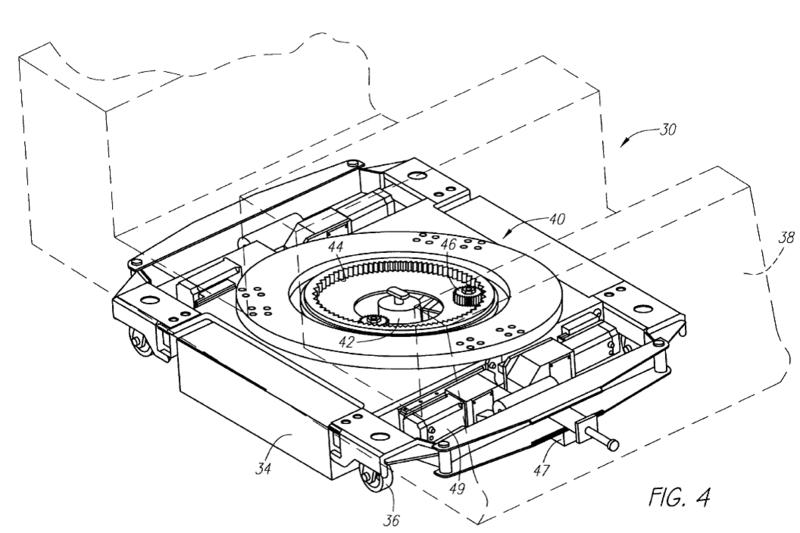 The turntable includes a ring gear attached to the body. A spin motor turns a pinion gear meshed with the ring gear, so that the vehicle body spins on the chassis when the spin motor is turned on. Diagram from the Men in Black: Alien Attack ride system patent. Just like on the Hogwarts Express, a busbar runs alongside the track to provide power to the RV. It’s kind of funny that a ride as technologically advanced as Escape from Gringotts is propelled along most of the path by good ole fashioned rubber tires. Notice the drive tires? Looking back towards the last scene. 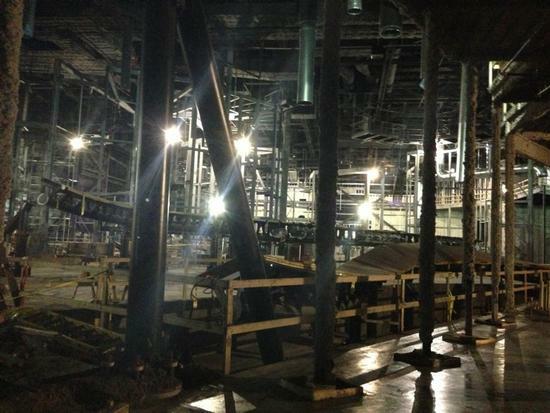 The first surprise encountered on Escape from Gringotts is the tilt track. 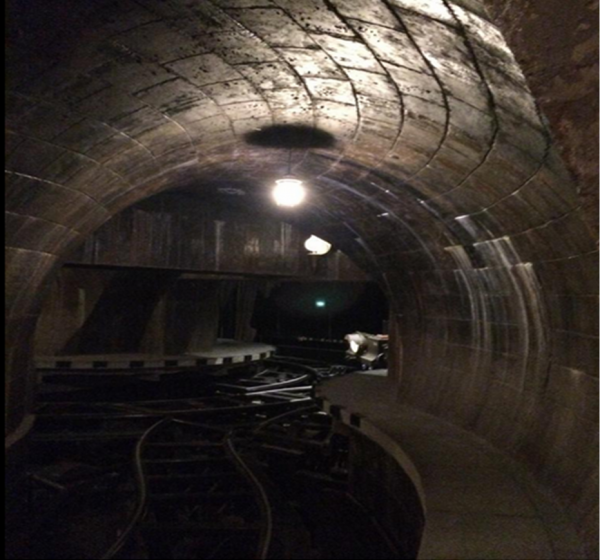 After departing the dual loading station, the cars negotiate a left hand turn into what appears to be a dead end. A video plays on a projection screen directly in front of the passengers when suddenly the section of track the RV is parked on begins to move. The track rotates about a center point with the lead car falling forward while the park car raises in the air. 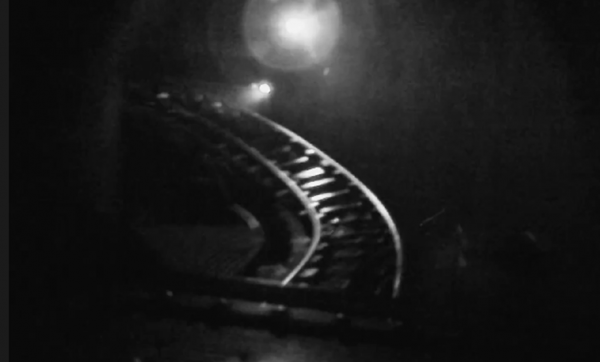 After a brief pause the trains is released and plunges downward into darkness. 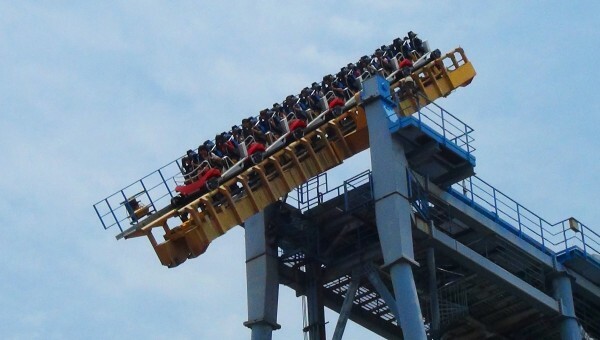 To get a good image of how this works tilt track works, see Vekoma’s Gravity Max tilt coaster built in Taiwan. 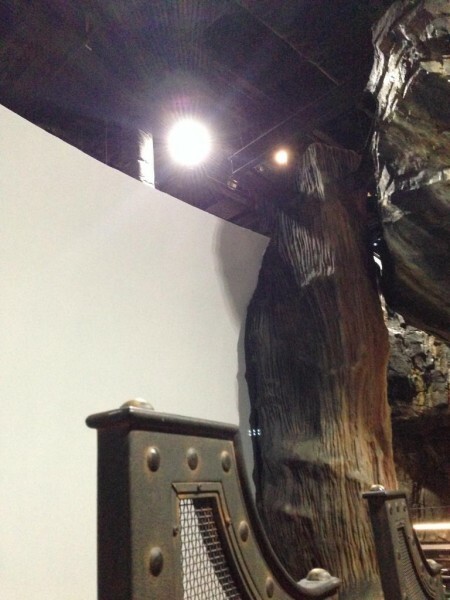 The main difference being Gravity Max has a vertical drop while Gringotts is only around forty degrees. The drop off of the tilt track is the largest coaster drop on the entire ride and is only about three stories – the same height as the stairs that take you from ground level to the loading platform. This also seems to be the only section where the extra heavy trains actually “coasts” on gravity. The “launch” track is on the left and the post-tilt track drop is on the right. Taken by Robert Niles. We discovered Universal’s patent for a motion base track segment over three years ago and it looks like they’ve finally put it to use. 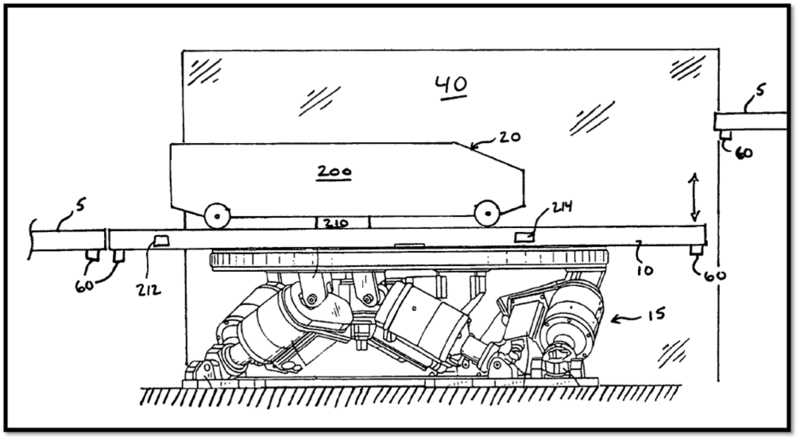 The motion base track patent basically shows they’ve taken the same mechanism used in the Spider-man/Transformers RV and stuck a piece of roller coaster track atop it. 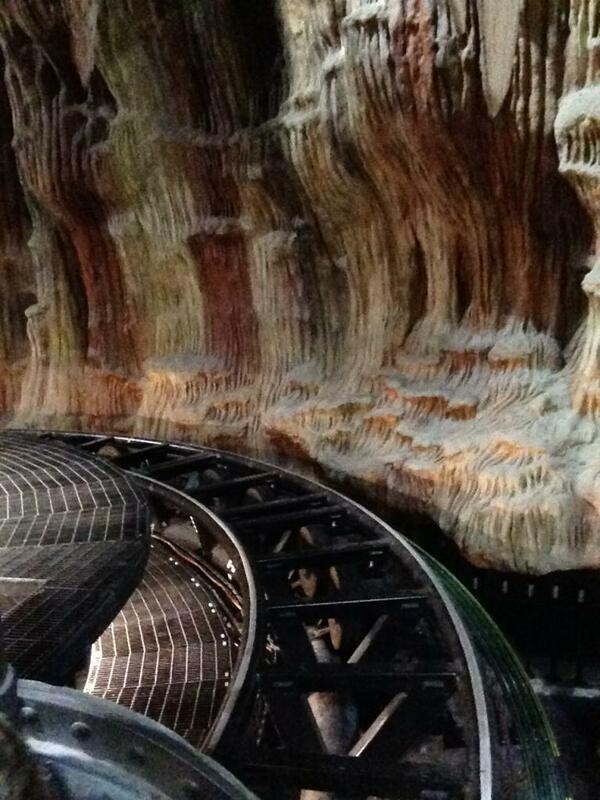 In Escape from Gringotts, the RVs roll onto a flat piece of track and stop. Rider’s are rotated 90 degrees to the side to face a projection screen where they watch a video segment that simulates a freefall from a great height. Both cars pitch forwards at once as the track segment now acts like a simulator platform with mulitple degrees of freedom. After the troll attack, the track segment quickly reconnects and the RVs are sent on to the next scene. The finale involves a giant, encompassing projection screen where a battle between Voldemort and Harry Potter perched atop a fire breathing dragon takes place. At the conclusion of the battle, fog effects obscures the fact that a portion of the projection screen has been removed and the next thing we know the RVs are being launched by the drive tires down the coaster track through the newly exposed opening in the screen. The track twists up and to the left, back up to the height of the load platform, while the RV rotates 360 degrees to the right at the same time. 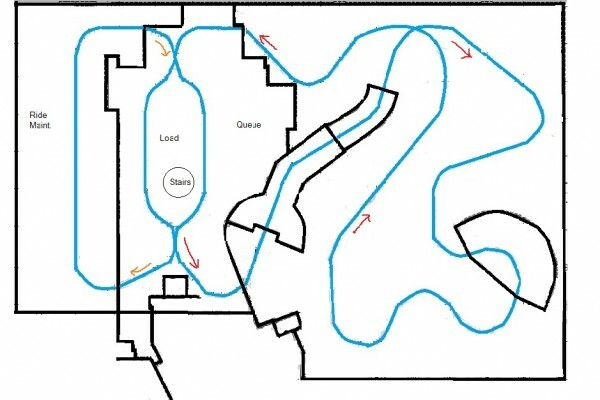 My guess is the maximum speed of Gringotts is between 20-30 mph as the forward motion combined with the spinning motion in tight quarters makes the ride feel faster than it actually is. In the video below, shot in nightvision, you can clearly see the outline of the movable screen and how the robotic arm it’s fixed to pulls it up and out of the way. The launch track in the background, post tilt track in the foreground. Taken by Robert Niles. At the end of the launch the track twists up and to the left while the cars spin to the right. 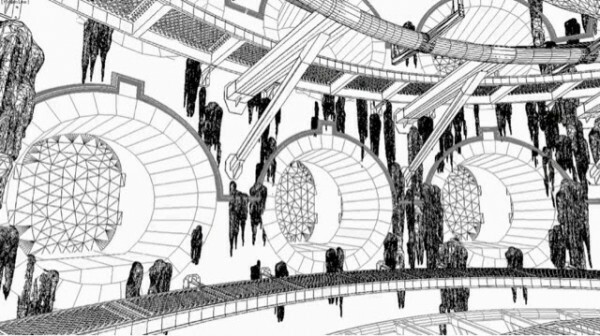 Blueprints of Diagon Alley leaked onto the internet several months before it opened and included a very clear overhead image of the Escape from Gringotts’ layout. 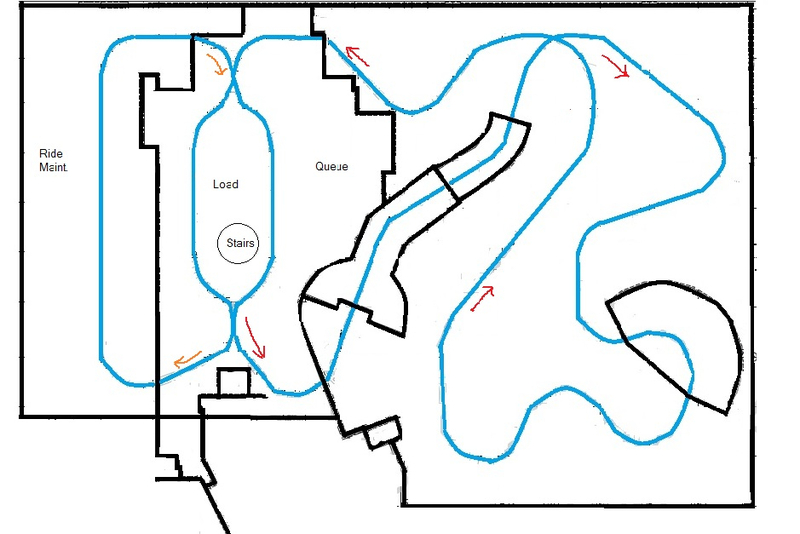 As you can see on the layout diagram, Gringotts has a dual loading station, just like Revenge of the Mummy. There are two sliding track switches on either side of the station to route trains to or from either loading platform or to the maintenance/storage area. Harry Potter and the Escape from Gringotts is a new type of high-tech thrill ride combining roller coaster type elements with simulator and dark rides. It’s like Universal took all the best elements from their best rides and combined them all into one amazing attraction. While not as intense as Forbidden Journey and with only a 42 inch height requirement, families will be lining up to ride for years to come. 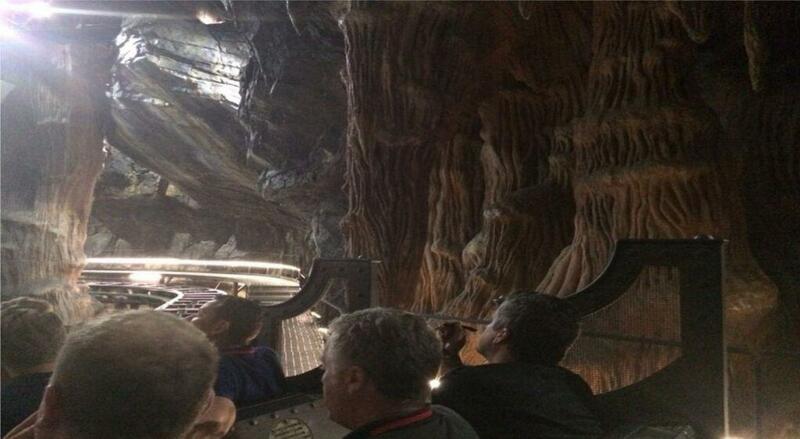 Have you gotten a chance to experience Gringotts? How long would you be willing to wait for it? If you want to learn more about how roller coasters work check out Coasters 101: An Engineer’s Guide to Roller Coaster Design. We only waited 35 minutes on June 3rd. It is definitely a fun ride, with the tilt track being a welcome surprise. It’s truly a great ride and Im glad my first time riding it I only had a 5 minute wait, but unfortunately we got stuck in the “elevator” for 15 minutes. Great experience though especially for those die hard Harry Potter fans! Great effects and originality but if is a very short ride and not worth queueing for long periods of time. Rode the ride on Tuesday 15th Nov 16 as single rider and wait time was 5 minutes, ride again today and was 20 minutes. This is currently my favorite ride at Universal.